UK manufacturer of stainless steel and aluminium silos Braby is celebrating the first anniversary of the launch of its servicing division. 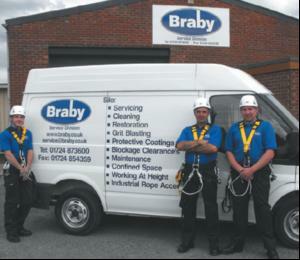 The firm says the demand for trained safe silo access staff, able to complete maintenance work under strict downtime conditions, has enabled Braby Service to demonstrate its expertise with highly satisfactory results. The Lincolnshire based outfit has also completed its first order with OCS for the maintenance of a 30 foot flour silo at the Allied Bakeries Cardiff bakery. Contractor OCS employed Braby Service to carry out a full inspection and thorough dry clean of the internal walls of the silo. Specialist photographic techniques were used to establish the internal condition of the silo and a full report made to OCS and Allied Bakeries.